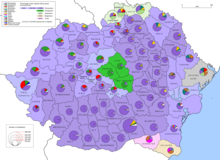 This article presents the demographic history of Romania through census results. See Demographics of Romania for a more detailed overview of the country's present-day demographics. The 1930 census was the only one to cover Greater Romania. Censuses in 1948, 1956, 1966, 1977, 1992, 2002 and 2011 covered Romania's present-day territory. All but the 1948 census, which asked about mother tongue, had a question on ethnicity. Moldavia and Wallachia each held a census in 1859. The Romanian Old Kingdom conducted statistical estimates in 1884, 1889 and 1894, and held censuses in 1899 and 1912. Ion Antonescu's regime also held two: a general one in April 1941, and one for those with "Jewish blood" in May 1942. Postage stamp issued in 1930, marking the census that year. Ethnic figures for 2011 are given as a percentage of individuals for whom data is available, while the "data unavailable" cohort is given as a percentage of the total population. ^ Recensământul populaţiei din 1930. Populaţia pe Neamuri (in Romanian). Institutul Central de Statistică. p. L. Retrieved 2014-06-08. ^ Recensământul populaţiei din 1930. Populaţia pe Neamuri (in Romanian). Institutul Central de Statistică. p. LI. Retrieved 2014-06-08. ^ Recensământul populaţiei din 1930. Populaţia pe Neamuri (in Romanian). Institutul Central de Statistică. p. XXIV. Retrieved 2014-06-08. ^ a b c d e "Hungarians in Transylvania between 1870 and 1995". Retrieved 2008-07-20. ^ a b c d "Populaţia după etnie la recensămintele din perioada 1930 - 2002, pe judeţe" (PDF) (in Romanian). Institutul Naţional de Statistică. Retrieved 2011-10-28. ^ "Populaţia după etnie" (PDF) (in Romanian). Institutul Naţional de Statistică. Retrieved 2011-10-28. ^ "Date naţionale" (in Romanian). Erdélyi Magyar Adatbank. Archived from the original on 29 September 2011. Retrieved 28 October 2011. ^ "Rezultatele finale ale Recensământului din 2011 - Tab8. Populaţia stabilă după etnie – judeţe, municipii, oraşe, comune" (in Romanian). National Institute of Statistics (Romania). 5 July 2013. Retrieved 18 December 2013. Wikimedia Commons has media related to Demographics of Romania.